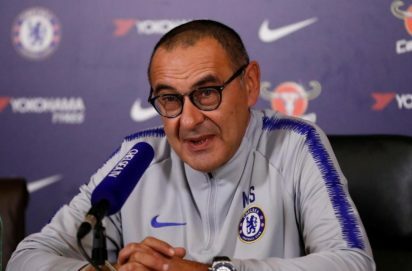 Chelsea are making a nasty habit of breaking records for the wrong reasons under Maurizio Sarri, with time running out for the Italian to avoid becoming the latest coaching casualty at Stamford Bridge. Even winning league titles was not enough to save Carlo Ancelotti, Jose Mourinho or Antonio Conte from Abramovich’s firing line and the gulf between Chelsea and City on Sunday showed just how far Sarri’s side are from the Premier League’s best right now. Despite a run of six defeats in 14 league games, an excellent start to Sarri’s reign means Chelsea are just one point behind a surging Manchester United — who have shown the impact a new manager can make — in the battle for a top-four finish. They also face United in the fifth round of the FA Cup next Monday, have the onerous task of taking on City again in the League Cup final on February 24 and face Malmo in the last 32 when the Europa League returns this week. It took 19 games for Sarri to suffer his first defeat, but since Spurs pressed Jorginho high up the field and exposed his lack of pace defensively in late November 3-1 win at Wembley, the blueprint to beat the Blues has been obvious. “Kante is wasted anywhere other than as arguably the world’s finest holding midfielder,” wrote the BBC’s Phil McNulty.